At Seesaw we enjoy publishing a range of voices. In this feature WA Academy of Performing Arts student Mae Anthony offers her insights as a Gen Z and a pianist in an interview with experimental pianist Zubin Kanga. Have you ever wanted to control what a performer does on stage? International experimental pianist Zubin Kanga is taking the idea of improvising on a theme to a whole new level, inviting audiences to hack his piano recital by uploading ideas to a website. The piece is called WIKI-PIANO.NET and will be performed as part of his recital at Subiaco Arts Centre, the penultimate leg of his national tour. PIANO EX MACHINA is the third in a series of unique programs (DARK TWIN (2015) and CYBORG PIANIST (2017)) containing pieces that merge elements of theatre, cinema, gaming, internet culture, and advanced technology. Nearly all of these pieces have risen from discussions and collaborations between the Australian/UK pianist and artists from around the world, resulting in funny, ironic and entertaining incarnations that offer insights into everyday life. WIKI-PIANO.NET by German composer Alexander Schubert is arguably the most exciting piece on the programme in the way that it attempts to provoke a genuine human engagement between performer and audience members. Its praxis is the embodiment of the kind of work that Kanga is pioneering through performance: the interaction between art, specifically the piano, and technology. Over the phone Kanga described the process Schubert used to create WIKI-PIANO.NET. The multimedia content is shown to the audience and then the performer must act out, and respond to, what is being shown. Growing up in Sydney, Kanga pursued studies not just in music but also in philosophy and computer science. His music studies from this well-rounded education included the opportunities to explore musical projects with a vast amount of freedom. From as young as 22 he worked with Damien Ricketson and Ensemble Offspring. This opened up possibilities for him to work with experienced senior musicians in other projects. Zubin Kanga is at the intersection of technology and piano. Photo Raphael Neal. Kanga says that building these relationships between himself as the performer and the composer is so essential to the outcome. One of his significant collaborators is Sydney saxophonist Ben Carey who will be performing in PIANO EX MACHINA. Carey’s piece taking the auspices is inspired by the flocking of starlings and uses artificial intelligence and 3D scans of objects to merge audio and visual elements live on stage. Carey is a technologist but also a saxophone player which gives him insight into Kanga’s performance practice. The program contains four other Australian works including a piece by monumental Australian composer and improviser Jon Rose, titled Ballast, a work comprising a whirlwind of sound using a 3D hand sensor. The use of new technologies in piano performance is where Kanga feels most at home, and it is also the essence of his research as a Leverhulme Research Fellow at the Royal Holloway, University of London. Continuing the theme of new technologies, A Novel Instrument by Australian composer Kate Neal, in collaboration with stop-motion animator Sal Cooper, explores the kinship between cars and pianos. One movement from this large music-theatre work will be premiered in PIANO EX MACHINA. It combines music, images, film, electronics, and piano to create a mixture of musical counterpoint, visuals and movement. Tristan Coelho’s work Rhythm City amalgamates looped urban film scenes with music. These visuals can be manipulated by the pianist using a midi keyboard and then is responded to at the piano. The union of video and piano can also be seen in Adam de la Cour’s Transplant the Movie 2!, a piece that presents as a short film and is a comical take on low-fi action and spy movies from the 1980’s. This piece is the sequel to Transplant the Movie! by the same composer based on early 20th century horror movies. Kanga resides in London for part of the year where he is able to immerse himself in the vibrant contemporary music culture in the U.K. He works closely with a number of British composers including de la Cour. Kanga says collaborative relationships of this kind create a space where he can merge other styles and interests, such as film, theatre, comedy, and movement on stage with music and work at the piano in particular. “Hopefully a few of these pieces will be quite funny, as well, rather than being just intense and serious which I think a lot of contemporary music can be,” Kanga said. Kanga has also contributed a composition to the program, a piece titled Transformations that manipulates sounds from the inside of a piano with those of an analogue synthesiser. It draws inspiration from the lives of his friends, family and colleagues who are experiencing changes to their internal, and in some cases external, bodies. It’s another aspect to Kanga’s adoptive process where his creative outcomes are grown from the seeds of input from others. His unique methodology enables Kanga’s performances to both provoke and amuse audiences and PIANO EX-MACHINA promises to continue that proud tradition. Zubin Kanga performs PIANO EX MACHINA at Subiaco Arts Centre on April 24. Be sure to visit http://wiki-piano.net leading up to the performance to add your own unique voice to the show. Pictured top: Zubin Kanga. Photo by Raphael Neal. Bach’s St Matthew Passion (Matthäus-passion) is generally regarded as one of the outstanding monuments of Western music. It uses text from the Gospel according to St Matthew to re-tell, indeed re-enact, the story of the crucifixion, with voice parts for a narrating Evangelist, Pontius Pilate, St Peter and Jesus himself. Musically, it is constructed in a framework of choruses, Lutheran chorales, recitative (accompanied and otherwise) and aria. The narrative is basically carried forward by stretches of unaccompanied recitative. It is a complex construction, but in performance can be a transfixing experience whatever one’s spiritual beliefs. It is also undeniably long. This led to some hesitancy in its reception in the eighteenth century, during which the most often performed passion was Graun’s Tod Jesu (1755). The Bach version’s more recent popularity is said to be due to Mendelssohn’s recuperation and abridgement in 1829, the centenary of its original premier. In modern times, unabridged versions are frequently performed and extensively recorded; it usually runs somewhere between two and a half and three hours, usually with at least one interval. Why then abridge at all? Audiences are able to sit through Wagner and extremely long movies like the Lord of the Rings series. For this performance by the West Australian Symphony Orchestra, the reason offered in the printed program is that “WASO rehearsal schedule is not limitless”. Why then do it at all? Why not the much more convenient (shorter) St John Passion, for instance? Obviously these are rhetorical questions but, on the one hand, audiences who know the work may be discombobulated and perhaps disappointed and, on the other, Bach’s intentions are embodied in a work which is very long but which is his best idea of how to present them. Any abridgement is second guessing the composer, who is after all generally regarded as a towering genius. Rather than the Mendelssohn version, the shortening in this case is the work of respected conductor Joseph Nolan, who has achieved wonders with the featured St George’s Cathedral Consort. In rejecting Mendelssohn’s version, he argues in the program that he has kept the “mainframe of the story intact and that the key relationships are seamless”. In so doing however about a third of the work – it came in at two one hour parts with an interval timed part way into Bach’s part two – has been lost, including such narrative segments as the Annointing in Bethany, the initial Betrayal of Judas, the Last Supper and half of the Interrogation by the High Priests, along with six arias and two chorales. So how does that work out in practice? In Part One, it seemed a breathless leap from the initial chorus and chorale to the soprano recitative and aria ‘Ich will dir mein Herze’, and similarly with the other cuts, so while the key relationships might not jar, the lack of continuity does, certainly for those who know the work. The other problem on the night, which might be related, was that Part One was dramatically inert; a lot of well delivered narrative, beautiful sounds and exquisite singing and playing overall, but no real excitement. Part Two, which was more intact, also fared better dramatically; from the soprano’s Erhat uns allen wohlgetan … Aus Liebe on was more gripping (albeit lacking the baritone’s Ja, freilich … Komm, susses Kruz and the alto’s Ach, Golgotha …Sehet! Sehet!). The concluding chorus Herr, wir haben gedacht was as riveting as it should be. On the plus side, the decision for the chorales to be sung a capella was more than rewarding, with the Consort’s well attested discipline and vocal beauty to the fore. The modern instruments of the small sized orchestra were played with Baroque sensibility if not pitch, and special mention should be made of concertmaster Laurence Jackson, particularly with respect to his solo accompaniment to Aus Liebe, Liz Chee exquisite on oboe throughout but noticeably in Ich will bei meinem Jesu and Mache dich, and flutemeister Andrew Nicholson. All was well supported by a continuo group comprising cello (Noeleen Wright) and chamber organ (Stewart Smith). Tenor Paul McMahon as the Evangelist with Andrew Foote (baritone) as Jesus held the work together with sterling performances. Sara Macliver’s ethereal but tensile soprano was as exquisite, and sung with as much feeling, as ever. As mentioned, her aria Aus Liebe raised the dramatic tension in Part Two creating, with the flute and oboes, a stunning aural effect. Mezzo-soprano Fiona Campbell is another local glittering star, and her creamy golden tone was well to the fore, particularly in the crowd-pleasing Erbarme dich. James Clayton’s resonant bass sounded somewhat restrained; the frequent positioning of the soloists behind the orchestra didn’t help. Richard Butler sang the solo tenor parts with a pleasant plangency but was not quite comfortable in the passage work. Smaller roles were competently sung by members of the chorus. The performance received warm if not quite rapturous applause. Some in the audience may have been remembering the Perth Festival performance of 2005, conducted by Graham Abbott and semi-staged by Lindy Hume, which included some of the same soloists and orchestral players with period instruments. It clocked in at something over three hours including one interval, with which everyone seemed to cope, and indeed it was totally absorbing. Perhaps the world, and Perth, have changed too much, but a future uncut or even less cut St Matthew Passion is surely not too much to hope for. Charisma is a slippery thing, impossible to define, but you know it when you’re in its presence. Mike Cheng-Yu Lee, dressed simply and evincing nothing more than a gentle friendliness, stepped up to the fortepiano and instantly had the audience in the palm of his hand from beginning to end. Playing without a score throughout, his concentration was intense, and the combination of familiar music and somewhat unusual instrument made for a fresh and most rewarding experience. Lee is currently director of the Australian National University’s Keyboard Institute – the largest collection of historical pianos in the southern hemisphere. On this occasion he was showcasing one of the historical instruments in WAAPA’s expansive keyboard collection in an all-Beethoven program. The instrument in question – the WA Academy of Performing Art’s McNulty-Walter fortepiano (1805) – is a replica by modern maker Paul McNulty of a Viennese original by Anton Walter. Lacking the pedals of a modern piano, the dynamics of this version is controlled by knee levers, and notes are generally less sustained, leading to a somewhat clipped sound, but generally sounding completely different to a harpsichord. Along with the famous Pathétique and Moonlight sonatas headlining the bill, other pieces by Beethoven were included. The first were the six short movements of the Bagatelles Op 126, from quite late in Beethoven’s career (1825) and covering a range of tempi and feelings which allowed the audience to appreciate the style and nature of the instrument and its potentialities. Every note was heard distinctively. Lee was able to produce noticeably varied dynamics, especially in the last two movements, filling the room with robust sound and tapering the sound down to a veritable whisper. The Grande sonata pathétique, or Sonata in C minor Op 13, is of course one of the most familiar pieces in the classical repertoire, but it was like hearing it anew. In some ways, Lee brought out the darker side of this with an almost tortured sound to the introductory passage followed by sustained precise attack. The Adagio cantabile contrasted with gentle warmth but no sentimentality, with just the slightest pause before launching into the Rondo: allegro with flying fingers and a crisp finish. After an interval we heard the Sonata in E minor Op 90, with its curiously and elaborately named two movements; the first was definitely played with the specified liveliness, feeling and expression throughout, and a lesson in dynamic effects. The second, marked by the composer as ‘not too fast and very song-like’, was indeed that, with soothing rippling effects and utterly lyrical withal. It is a toss-up as to whether the Sonata in C sharp minor (Op 27 No 2) Quasi una fantasia but known as the Moonlight Sonata is more famous than the Pathétique, but in both cases Lee’s presentation brought something new. The first movement was played relatively slowly, making it somewhat of a cloudier moonlight than is usual, while the allegretto was perhaps a little faster, and livelier. The Presto agitato lived up to its description with quite a furious attack, but with every note clearly articulated and another satisfyingly concise ending. Pictured top: The charisma of Mike Cheng-Yu Lee. Has there ever been so fruitful a period of choral performance in Perth as that now under way? Six months of eclectic and stimulating repertoire has included the visiting Estonian Philharmonic Chamber Choir, the Choralfest currently underway in Fremantle and still to come the WA Symphony and St George’s Cathedral performing Bach’s St Matthew Passion on Tuesday. 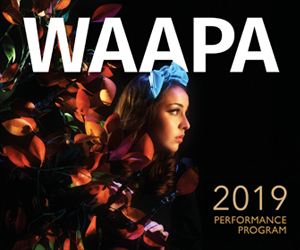 The WA Academy of Performing Arts has inaugurated the 2019 season with a somewhat unexpected programme. “Fauré’s Requiem” was the concert title, but there in the small print of the Academy’s website was Telemann’s Concerto in E minor for Two Violins and Basso Continuo TWV 52:e4. Harking back to a world some 250 years distant, this work provided an effective and enjoyable opener. A double concerto is always a tantalising prospect, and conductor Paul Wright and Adrian Biemmi on the other violin proved to be beautifully matched soloists. Together with the WAAPA String Camerata, they did ample justice to this rarity. Thereafter we were onto choral terra firma, the WAAPA Chamber Choir delivering four short unaccompanied works, three of them motets by Poulenc. The first of these, Timor et Tremor, written in 1939 for Holy Week, was followed by two Christmas motets, composed in 1952. Well-meshed and balanced choral sound conveyed the spirit of the works and, in the last, allowed Poulenc’s distinctive harmonies to be savoured. On paper, Edward Elgar seemed an unlikely candidate to conclude this bracket, but he did so most effectively. His brief elegy They Are at Rest was written for the 1910 anniversary of Queen Victoria’s death. A setting of words by Cardinal Newman, and displaying echoes of his Dream of Gerontius, it received a poised rendition by the choristers under conductor Kristin Bowtell. And so to the title work of the evening. Fauré’s Requiem last received a very fine Perth performance in November under Dr Margaret Pride, and if another outing just five months later seemed excessive, this was certainly not the case. The first, with large chorus and orchestra, was very much what one might expect at Perth Concert Hall. Now, in St Mary’s Cathedral, with a modestly-sized WAAPA Symphonic Chorus and organ accompaniment (Stewart Smith), we were very much closer to a liturgical performance, albeit that the French church authorities of Fauré’s time would have insisted on an all-male vocal line-up. Here we had the choristers intermingled rather than grouped by voice-type, sometimes for the better, occasionally less so, although this arrangement did gain in effectiveness as the performance progressed. The two baritone soloists, Nathan Breeze and Kyle Garces, both brought a pleasing quality that was entirely consistent with the fresh and firm choral tone surrounding them, rather than projecting in an overtly soloistic manner. Ashley Chua’s Pie Jesu was confidently and cleanly declaimed, while Paul Wright’s solo violin in the Sanctus added a moment of distinction. While a cathedral setting is most apt for a work such as this, the acoustic does pose its challenges. By the time of the Agnes Dei, however, the choral sound was cutting through most satisfyingly, although here, with the spotlight on the tenors, the disadvantage of their scattered disposition was revealed. Nevertheless, this was the movement in which the performance came into its stride and where the choir sounded truly integrated, as it did to the conclusion of the work. Judged by this season opener, there are some very fine things happening at the WA Academy of Preforming Arts, and music director Kristin Bowtell and his forces have provided a tantalising foretaste of what may be in store this year. It is two years since the Brandenburg Quartet formed with a mission to perform classical quartet repertoire on period instruments. The quartet comprises the principal string players of the Australian Brandenburg Orchestra and is the only quartet in the country performing exclusively on gut strings. The ensemble’s period of focus – the late 18th and early 19th century – is the golden age of string quartet writing, dominated by the output of the well-known figures of Haydn, Mozart and Beethoven. Yet for their first tour for 2019 the quartet included on the program two works you have probably never heard before: quartets by the French composer Hyacinthe Jadin and Italian-born Gaetano Brunetti. Sitting alongside Boccherini’s Quartet in D G165 and Beethoven’s Quartet in C minor No 4, it was an intriguing line up. First violinist Shaun Lee-Chen is well-known to Perth audiences as a member of the WA Symphony Orchestra, a position he now juggles with his role as concertmaster of the ABO. He has spent two years working in quartet format with Ben Dollman (Adelaide) on second violin, Monique O’Dea (Sydney) viola and Jamie Hey (Melbourne) cello, and the quartet is beginning to take on its own identity. On Tuesday night, in the radiant acoustic of the Government House Ballroom, the sparing vibrato and the lighter sound of period instruments gave the ensemble litheness and a well-knit blend. The performers clearly relished the classical era’s penchant for contrasting delicacy with explosive energy, particularly evident in Jadin’s sophisticated and highly romantic Quartet No 1, a welcome new discovery. Lee-Chen’s inspired phrasing brought pained eloquence to the phrases of slow movements, in particular the exquisite Adagio in Boccherini’s Quartet in D.
The well-balanced program placed the vibrant vignettes that comprise Brunetti’s Quartet No 4 alongside the brooding darkness of Beethoven’s C minor Quartet No 4. Beethoven’s adventurous changes of tonality had an almost shocking aural impact thanks to the colours of the gut strings, tuned slightly lower at 430 Hz. It was an engrossing performance. But I have quibbles too. The opening work of the program (Boccherini) was unsettled with slapdash starts to phrases. Lee-Chen’s assertive musical ideas sometimes came at the expense of unity within the ensemble. And the program didn’t list the movements of each work which created an unnecessary stumbling block for the uninitiated (who were left wondering when to clap) and was a missed opportunity in terms of audience engagement. Dollman’s insightful introduction from the stage was all too brief; chamber music has the potential for much richer transactions with an audience already attracted to the intimacy and intellectual richness of this musical genre. More could be done here if the quartet intends to grow a loyal, informed audience. The Brandenburg Quartet national tour continues to Brisbane on April 12 and Adelaide on April 13. Featuring the music of Mikis Theodorakis, Greece’s most popular and best known living composer, Romiosini and Beyond includes, for the first time in Perth, a performance of his masterpiece, Romiosini, the well-loved song cycle based on the poetry of Yannis Ritsos. Romiosini describes the feelings of oppression and suffering endured by the poet and his Greek compatriots while their country was under foreign occupation. It so influenced Mikis Theodorakis that he subsequently immortalised the work in evocative music of power and supplication, especially in songs such as ‘When They Squeeze the Hand’ which have particularly captivated the nation. Internationally-renowned Greek singer and musician, Dimitris Basis, will also travel to Perth for this landmark performance. Basis has been a frequent collaborator with Mikis Theodorakis and has developed an intimate affinity with his music across several decades. Together with his critically-acclaimed interpretations of Yannis Ritsos’ work, Basis was a natural choice for this production. Outside his home country, Mikis Theodorakis is probably most widely known for his film scores including”Zorba the Greek” (1964), “Z” (1969) and “Serpico” (1973). Romiosini and Beyond provides a unique opportunity for Perth audiences to experience the wider oeuvre of one of the most important musical composers of our age. Based in Perth, Tim Voutas’s piano playing is energetic and colourful. His early classical piano playing got him into music and then luckily steered him towards Jazz. He graduated the GIJ academy big band in 2013 and WAAPA in 2017. From there he has been performing around Perth in his own groups “TVQ” (Tim Voutas Quartet) and “The Island Trio.” He is also a member of the Perth Cabaret Collective.